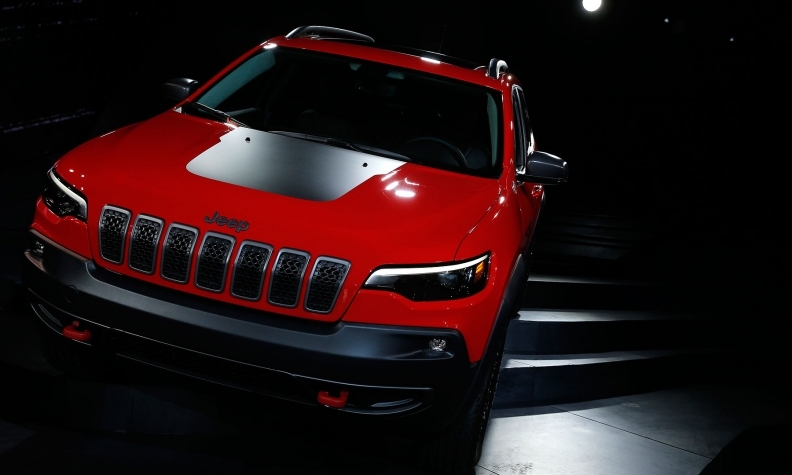 Jeep introduced a refreshed Cherokee with a new front fascia at this month's Detroit show. DETROIT -- Jeep's global vehicle sales fell 1 percent to less than 1.4 million last year and the brand is likely to miss its 2 million target this year, denting Fiat Chrysler Automobiles CEO Sergio Marchionne's ambition to make the SUV brand a global powerhouse. Jeep's 2017 deliveries dipped to 1,388,208 from 1,401,321 in 2016, according to FCA internal documents seen by Automotive News Europe. FCA does not release global sales for its brands. Jeep boss Mike Manley said at this month's Detroit auto show that the brand’s sales were "broadly flat" last year. Jeep’s decision to reduce unprofitable fleet sales in North America, it biggest market, hit the brand’s volume. Jeep reduced U.S. fleet deliveries by 60 percent, Manley told reporters at the show. Jeep’s U.S. sales declined to 828,522 from 926,376 in 2016, according to FCA data. In Europe, Jeep increased its vehicle sales in 2017 but at a slow pace despite a fast-growing SUV market. FCA has done a "lousy job" with Jeep, FCA CEO Sergio Marchionne said in Detroit. Marchionne is upset that the Jeep Cherokee is not selling well in a growing segment. "If you look at the numbers of the Cherokee in Europe, we haven't done right," he said. "I have now run out of patience, so we will get it done." Jeep sold 131,051 vehicles in its Europe, Middle East and Africa region, of which Europe makes up the major part, according to internal data. This was 2,684 more than in 2016. Registrations increased 3.5 percent to 108,155 in the EU and EFTA markets, data from industry association ACEA show. The Grand Cherokee was Jeep’s No. 2-seller in Europe in 2017 with sales of 19,392, down from 22,025 in 2016, according to FCA data. Cherokee sales were 6,706, down from 11,866. Sales of the brand’s best-seller, the Renegade subcompact SUV, fell by 3,886 units to 79,123. Compass sales were 16,170, up from 1,372 following the introduction of a new model. Jeep’s sales in its Asia Pacific region including China rose 36 percent to 240,901, company data show. Jeep will get a boost in China with the launch of the Grand Commander seven-seat SUV. The Cherokee-based model is expected to debut at the Beijing auto show in April. FCA’s business plan for 2014 to 2018 initially targeted 1.9 million Jeep sales globally this year, a figure later raised to 2 million by Marchionne. In Detroit, Manley did not confirm the 2 million target. He said the reduction of the fleet sales will continue this year. “We will look to our retail markets and see how much more they can make up,” he said. Marchionne said in Detroit that FCA has no intention of selling the Jeep brand to a Chinese automaker or other parties because it is counting on the marque to drive future profits. Jeep could account for one in five SUV sales globally, Marchionne told Bloomberg. This would equate to about 5 million deliveries a year. Marchionne said Jeep missing its 2 million sales target for this year will not be a tragedy because financial targets are more important. If Jeep misses the target by 50,000 Jeeps, "I will have a private discussion with Manley," he said. But if FCA as a group misses its 9 billion euros operating profit target, "I would have to discuss it publicly with analysts and that wouldn't be a good discussion," he said. FCA will announce 2017 full-year and fourth-quarter results on Thursday.